I’m really (unreasonably) excited to show you this cute and simple Halloween mani. All you need is a dotting tool or a cut toothpick (so you have a larger tip to work with) and a few colours of seasonally appropriate nail polish and you’re set! I really love this look for when you’re kinda sorta into the Halloween mani spirit, but you really can’t be bothered to do something super complicated. I wanted something sort of subtle, so I chose grey instead of black, and I used a paler orange to keep things from being too attention grabbing. 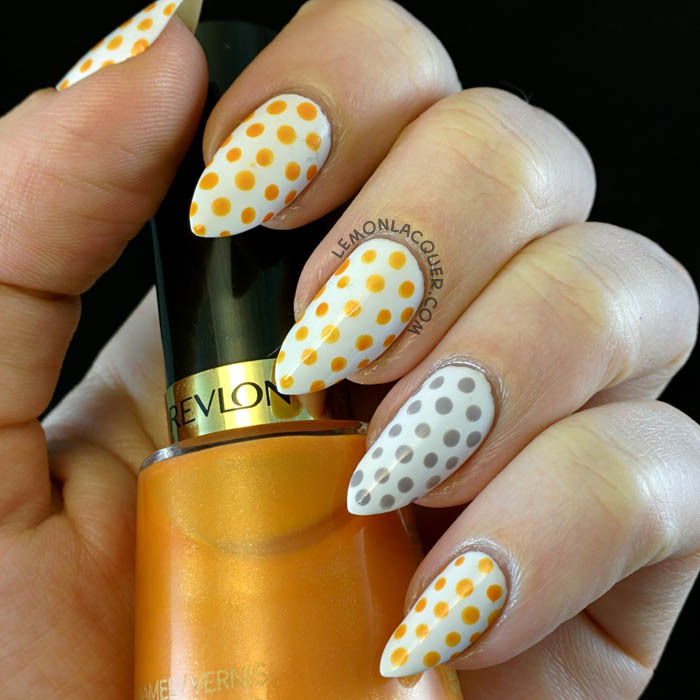 I used three coats of China Glaze – White on White for my base, and then dotted on a pattern with Revlon – Tangerine and China Glaze – Change Your Altitude. This is honestly my first full polka dot manicure, and to get the dots down, I first dotted a line straight down the center of my nail, starting at the cuticle to the tip. Then I offset the next column of dots so I was dotting in the gaps, and proceeded to cover the nail like that. I waited for about 15 minutes before I applied top coat, to minimize the risk of smearing the dots, and I also used a good drop of polish and a gentle hand to float the top coat over the nail. Have you thought about trying some of the more pastel looks for Halloween? I’ve seen some lovely lavender looks going around as well. When was the last time you did a polka dot mani? What do you think of my first attempt at one?